A Church of the Second Advent, as the dwelling place of God, is not the structure built by human hands but those grounds of natural elements fashioned by the Hand of God; in keeping with traditional scripture (Exodus 20:25, Amos 5:21-25, Isaiah 9:1-5, Revelation 8:3, 9:13) and the sacred scripture of the Second Advent Church, it is where the liturgy revealed of God is performed. 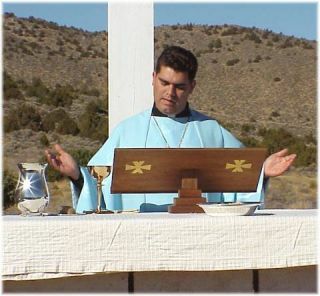 A church on sacred grounds may be enclosed by running walls, and its communion tables covered by a canopy with sides open to the elements, but never roofed; divine worship is performed only in a consecrated open-air church. As a place for divine worship, the high place or mountain is indispensable to the erection of any consecrated church. A church is sacred by virtue of the acts that take place within it following consecration; these acts being the performance of the liturgy in accordance with the sacred calendar and the prescribed liturgical books. Churches are oriented according to church ecclesiology, situated on holy mounts, and consecrated and blessed by the Patriarch of the Church in conformity with sacred law. The southern Sanctuary of Prophecy is dominated by high places. The Temple Mount, the highest point in the Sanctuary, rises steep along the Sanctuary's southern boundary, and the peaks of several mountains form a lofty ridge along the Sanctuary's western boundary. Elevations range from 5200 to 6000 feet above sea level. The northern Sanctuary of Revelation is all high ground, with elevations ranging from 5500 to 6500 feet above sea level. The terrain is rugged and steep. Its roads and pathways wind along the sides of mountains. The Sanctuary grounds are often subject to strong winds and generally remains covered with snow throughout the winter.